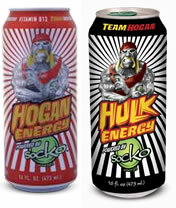 The Hogan Energy Drink is made by the people (Bliss Beverages) that bought us Socko. The drink was first named "Hulk Energy" but at some stage underwent a name change to Hogan energy. The drink is named after former wrestling star Hulk Hogan. There is also a sugar-free version. How Does Hogan Energy Compare? Hogan Energy contains 10.00 mgs of caffeine per fluid ounce (33.81mg/100 ml).